There're a ton of ways to make a bike ride more enjoyable, though technically "taking your car" probably doesn't count. For a more plausible bike-ride-enhancing alternative, check out Tour de Fat. Starting at Lindley Meadows on Saturday and stretching a total of four not-very-tiring miles through Golden Gate to the finish line, New Belgium Brewing Co's TDF is a touring, costumes-encouraged bike n' beer festival that's essentially Bay to Breakers on wheels, or more specifically, NOT stolen Safeway shopping carts. Post-biking fun'll include street-food-style eats, a beer garden with six NB brews on tap, free-to-ride, custom trick bikes, a four-heat race to find the "Slowest Rider in SF", and the ever-intriguing Port-a-Potty Karaoke, which would be even better if people were only dropping beats. They'll also be hooking up one lucky San Franciscan with a sick hand-built Black Sheep commuter bike in exchange for their hooptie and pledge to live sans-car for a year, but not sans-Carr for a year, since that would only mean more Alex Smith. 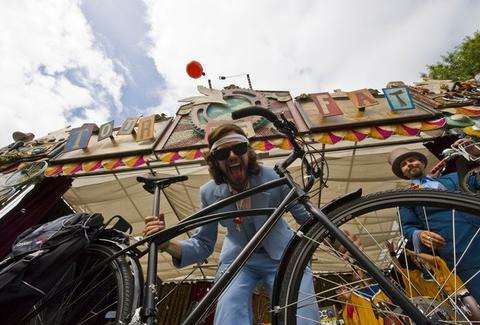 Oh, and don't worry about where to leave your bike during the festivities, TDF'll be doing complimentary valet bike parking, perhaps the the most effective way to make your ride more enjoyable, now that you've destroyed your car hitting bicyclists.